The brain’s billions of neurons communicate with one another using electrical signals. Applying a magnetic field to a small area of the scalp can temporarily disrupt these signals by inducing small electrical currents in the brain tissue underneath. The currents interfere with the brain’s own electrical signals and temporarily disrupt the activity of the stimulated brain region. This technique, which is known as transcranial magnetic stimulation, is often used to investigate the roles of specific brain regions. By examining what happens when a region is briefly taken ‘offline’, it is possible to deduce what that area normally does. Transcranial magnetic stimulation is also used to treat brain disorders ranging from epilepsy to schizophrenia without the need for surgery or drugs. But despite its widespread usage, little is known about how transcranial magnetic stimulation affects individual neurons. Neurons are made up of a cell body, which has numerous short branches called dendrites, and a cable-like structure called the axon. Neurons signal to each other by releasing chemical messengers across junctions called synapses. The chemical signals are generally released from the axon of one neuron and bind to receptor proteins on a dendrite on another neuron to stimulate electrical activity in the receiving neuron. Murphy et al. have now investigated how transcranial magnetic stimulation affects the activity of dendrites from neurons within the cortex of the rat brain. This revealed that the magnetic fields stimulate other neurons that inhibit the activity of dendrites from neurons within the deeper layers of the cortex. The inhibition process depends on a type of receptor protein in the dendrites called GABAB receptors; blocking these receptors prevents transcranial magnetic stimulation from altering the activity of stimulated brain regions. The processes occurring in these dendrites have been linked to cognitive function. The next challenge will be to integrate the non-invasive transcranial magnetic stimulation approach with cognitive tests in humans that can now manipulate dendritic activity to test their importance under various circumstances. Transcranial magnetic stimulation (TMS) holds great promise as a non-invasive method that can be used to both enhance and impair cognitive abilities (Eldaief et al., 2013). As such, it has proved to be an important tool for addressing basic questions about brain function as well as for diagnostic and therapeutic purposes (Fregni and Pascual-Leone, 2007). Stimulation is produced by generating a brief, high-intensity magnetic field by passing a brief electric current through a magnetic coil. As a general rule, TMS affects the action of feedback projections (Juan and Walsh, 2003; Hung et al., 2005; Camprodon et al., 2010; Zanto et al., 2011) leading to a disruption in perception (Shimojo et al., 2001; Kammer et al., 2005). Due to this influence on higher order cognitive processing, TMS is not only useful for examining the interactions of different brain areas (Pascual-Leone and Walsh, 2001; Silvanto et al., 2005; Murd et al., 2012), but it has also been used as a therapeutic method to alleviate some of the symptoms of hemispatial neglect (Nyffeler et al., 2009), schizophrenia including auditory hallucinations (Giesel et al., 2012), pain, depression and epilepsy. Despite great interest (Mueller et al., 2014), the cellular influence of TMS has yet to be ascertained since the precise effects of TMS at the level of a single neuron are very difficult to gauge, particularly in humans. The neural architecture of the brain means the neural processes which receive and transform most synaptic inputs, the dendrites, extend into the upper layers where TMS would be most effective. Since dendrites can shape synaptic input to be greater or less than their linear sum (Polsky et al., 2004; Losonczy and Magee, 2006; Larkum et al., 2009) thereby altering the firing properties of the neuron (Larkum et al., 1999), the active properties of dendrites have attracted attention and have been linked to cognitive processes and feature selectivity (Lavzin et al., 2012; Xu et al., 2012; Smith et al., 2013; Cichon and Gan, 2015). Furthermore, it has been suggested that active dendritic processing underlies a more general principle of cortical operation that facilitates parallel associations between different cortical regions and the thalamus (Larkum, 2013) which is controlled by dendritic inhibition (Palmer et al., 2012; Lovett-Barron and Losonczy, 2014). Establishing the validity of this hypothesis will have important ramifications for understanding brain function as a whole. TMS presents a most promising way to study the causal relationship between active dendritic properties and cognition but only if its effect on dendrites can be understood and ultimately controlled. Using an optical fiber imaging approach, here we present a study examining the effect of TMS on sensory-evoked dendritic activity in layer 5 pyramidal neurons of the somatosensory cortex. 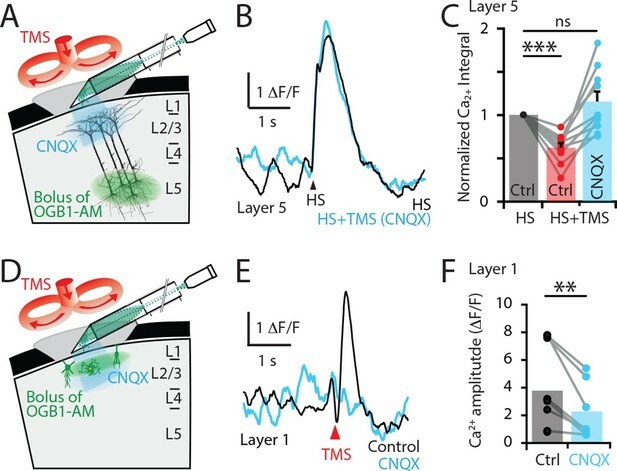 We find that TMS suppresses dendritic Ca2+ activity evoked by tactile stimulation and that this suppression can be abolished by blocking GABAB receptors and excitatory transmission in the upper layers of the cortex. We uncover the cellular mechanisms underlying TMS-evoked inhibition, demonstrating that TMS of the rat brain activates long-range fibers that leads to the activation of dendrite-targeting inhibitory neurons in the upper cortical layers which in-turn suppress dendritic Ca2+ activity. Since indirect brain stimulation shows immense promise in treating many neurological disorders, such as epilepsy (Berenyi et al., 2012), this study not only illustrates the cellular mechanisms underlying TMS but also highlights dendrites as potential targets for therapeutic approaches. We recorded the Ca2+ activity in populations of layer 5 (L5) pyramidal neuron dendrites in the hindlimb somatosensory cortex of urethane anesthetized rats using a custom-made fiber optic 'periscope' in vivo (Murayama et al., 2007) oriented horizontally for use in tandem with a TMS coil (Figure 1A, Figure 1—figure supplement 1A). Pyramidal neurons located approximately 800 μm below the cortical surface were loaded with the Ca2+ indicator Oregon Green BAPTA1 AM (OGB1 AM; Figure 1A inset and see 'Materials and methods'). Using this approach, large dendritic Ca2+ responses to brief hindpaw stimulation (100 V, 1 ms) were reliably evoked after 70 min loading with OGB1 AM (Figure 1—figure supplement 1B). To investigate the effects of TMS on evoked cortical network activity, the TMS coil was positioned just above the craniotomy (Figure 1A) and a single brief TMS pulse was evoked together with the stimulation of the hindpaw (Figure 1B) greater than 70 min post loading with OGB1 AM. TMS caused a significant decrease in the hindpaw-evoked dendritic Ca2+ response when triggered 50 ms before hindpaw stimulation (Figure 1C and Figure 1—figure supplement 2A), both in the maximum amplitude (control, 7.3 ± 1.5 △F/F versus TMS, 5.0 ± 1.1 △F/F, n = 17, p<0.05) and integral (control, 4.3 ± 0.9 △F/F•s versus TMS, 2.4 ± 0.6 △F/F•s; n = 17; p<0.001, Figure 1D). Further, the size of the coil (Figure 1—figure supplement 2B) and the type of hindpaw stimulation (Figure 1—figure supplement 2C) did not influence the results, whereas the distance of the coil from the cortical region of interest influenced the effectiveness of the TMS inhibition on the dendritic sensory responses (Figure 1—figure supplement 3). TMS inhibits sensory evoked Ca2+ activity in layer 5 dendrites. (A) Schematic of the experimental design. Layer 5 pyramidal neurons were bulk loaded with OGB1-AM and dendritic Ca2+ activity was recorded using a flat-periscope configured horizontally and inserted underneath the TMS coil from the side. The TMS coil was placed above the dendrites in the hindpaw region of the somatosensory cortex. (B) Typical dendritic Ca2+ response to hindpaw stimulation (HP) alone (black) and during a single TMS pulse (red) and HP alone post-experiment (grey). (C) Overlay of traces in (b) and (D) graph illustrating the decrease in Ca2+ response during TMS (n=17). p<0.001 (***). TMS, transcranial magnetic stimulation. What is the cause of this TMS-induced decrease in dendritic calcium activity? L5 pyramidal neuron dendrites have been previously shown to be strongly inhibited by the activation of post-synaptic GABAB (Pérez-Garci et al., 2006; Chalifoux and Carter, 2011; Palmer et al., 2012) receptors. To test whether GABAB receptors are predominantly causing the TMS-induced dendritic inhibition, the GABAB antagonist CGP52432 was locally perfused into the recording region (Figure 2A) affecting up to 300 μm of the surrounding tissue (Figure 2—figure supplement 1). Blocking GABAB receptors prevented the TMS-evoked decrease in the Ca2+ response to hindpaw stimulation in both the integral (controlcgp, 2.3 ± 0.5 △F/F•s versus TMScgp, 2.1 ± 0.5 △F/F•s; p=0.62) and maximum amplitude (controlcgp, 7.7 ± 2.8 △F/F versus TMScgp, 7.2 ± 1.9 △F/F; n = 7; p=0.66, Figure 2B). L5 dendrites have been shown to also be inhibited by the activation of GABAA (Kim et al., 1995; Murayama et al., 2009) receptors. Although cortical application of Gabazine causes a six-fold increase in the sensory evoked dendritic response (Figure 2—figure supplement 2), block of GABAA receptors also prevented the TMS-evoked decrease in Ca2+ response to hindpaw stimulation (HS amplitude, 130 ± 30% of control; n = 6; Figure 2—figure supplement 2). 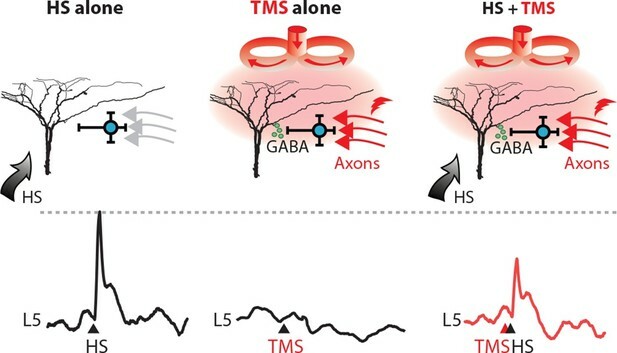 Taken together, the fact that blocking both GABAA and GABAB receptors abolished the dendritic effect of TMS s.
TMS causes GABAB-mediated inhibition of layer 5 dendrites. (A) Schematic of the experimental design illustrating the application of the GABAB antagonist CGP52432 on the cortical surface. (B) Typical dendritic Ca2+ response to hindpaw stimulation (HS) alone (grey) and during a single TMS pulse (orange, HS+TMS) during cortical CGP. (C) Block of TMS-evoked inhibition of the dendritic sensory response in the presence of CGP52432 compared with control (prior to CGP52432; HS, black; HS+TMS, red; n=7). p<0.05 (*). To investigate the laminar profile of the influence of TMS on neuronal activity, the Ca2+ indicator OGB1-AM was injected at different cortical depths (L5, 800 μm; Layer 2/3, 300 μm; Layer 1, 100 μm) and the Ca2+ response to TMS alone was recorded. TMS itself did not directly activate L5 pyramidal neuron dendrites (Figure 3A; n = 4), contrasting greatly to the large TMS-evoked Ca2+ response in cells within layer 2/3 (L2/3; 3.0 ± 1.1 △F/F; n = 3; Figure 3B) and layer 1 (L1; 5.5 ± 2.1 △F/F; n = 12; Figure 3B). 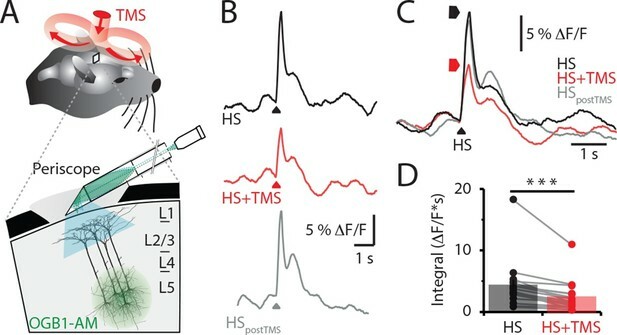 Importantly, the TMS-evoked Ca2+ response in these upper cortical layers was similar to the response evoked by physiological stimulation via hindpaw stimulation (L2/3, 3.5 ± 1.2 △F/F•s and L1, 6.4 ± 2 △F/F•s). The lack of a direct response to TMS in L5 pyramidal neuron dendrites implies that the inhibition of sensory evoked dendritic transients was mediated by the action of inhibitory neurons. Furthermore, the response to TMS in upper-layer neurons leaves open the possibility that local inhibitory neurons might be recruited by TMS either directly, via TMS-induced membrane activation or indirectly, via synaptic transmission. Upper layers of the cortex have Ca2+ transients in response to TMS. (left) Schematic diagram illustrating Ca2+ indicator loaded into (A) layer 5, (B) layer 2/3 and (C) layer 1. For each cortical depth, the Ca2+ indicator loading location (green circle) and target neurons (green) are indicated. (right) Ca2+ activity was recorded in response to a single TM pulse. (D) Comparison of the integrals of the TMS-evoked Ca2+ responses recorded at the different cortical depths. TMS, transcranial magnetic stimulation. To test these possibilities, the Ca2+ response to hindpaw stimulation was recorded before (5.5 ± 3.3 △F/F•s) and after (3.2 ± 3.6 △F/F•s) blocking synaptic transmission by locally applying the AMPA antagonist CNQX to the upper cortical layers at the site of the recording (Figure 4). Under these conditions, CNQX prevented the inhibitory effect of TMS in L5 pyramidal neuron dendrites (n = 10; Figure 4A–C and Figure 4—figure supplement 1). Therefore, since blocking excitatory AMPA-mediated transmission prevented the TMS inhibitory effect, TMS-evoked inhibition in L5 pyramidal neuron dendrites must be of polysynaptic (indirect) origin. We next tested whether the TMS-evoked Ca2+ transient in L1 was also of synaptic origin as TMS influenced cell activity in the upper cortical layers (Figure 4) and therefore possibly provides the TMS-evoked inhibition of L5 dendrites. Indeed, TMS-evoked activity in L1 neurons was suppressed by CNQX application, significantly reducing the Ca2+ response amplitude by 53 ± 7% (n = 8; p<0.05; Figure 4D–F). Therefore, the TMS-evoked Ca2+ response in L1 neurons is of synaptic origin. Taken together, this data suggests that the inhibition of sensory-evoked L5 dendritic Ca2+ responses was primarily mediated by upper-layer inhibitory neurons driven to fire synaptically from neurons or axons recruited by TMS. TMS directly activates cells in the upper cortical layers. (A) Schematic diagram of the experimental design. Layer 5 pyramidal neurons were bulk loaded with OGB1-AM and dendritic Ca2+ activity was recorded using a side-on (horizontal) periscope during application of CNQX to the upper cortical layers. (B) Typical dendritic Ca2+ response to hindpaw stimulation (HS) alone (black) and during a single TMS pulse in the presence of cortical CNQX (blue). (C) Ca2+ responses (integrals) during HS+TMS in the presence (blue) and absence (red) of CNQX normalized to control HS (black; n=10). (D) Schematic diagram of the experimental design. Layer 1 neurons were bulk loaded with OGB1-AM and dendritic Ca2+ activity was recorded during TMS using the side-on periscope during application of CNQX into the upper cortical layers. (E) Dendritic Ca2+ response to a single TMS pulse (black) and in the presence of cortical CNQX (blue). (F) Amplitude of the TMS-evoked Ca2+ responses in L1 neurons during control (black) and CNQX (blue) (n=8). p<0.005 (**), p<0.001 (***). TMS activates an inhibitory microcircuit in the upper cortical layers. Hypothesized effect of TMS on cortical processing; TMS activates axons (red) which excite upper layer interneurons (blue) causing GABA neurotransmitter release (green) which provides GABA-mediated inhibition to layer 5 pyramidal neuron dendrites. (left) Hindpaw stimulation (HS) causes large Ca2+ responses in layer 5 pyramidal neuron dendrites. (middle) TMS directly activates upper layer neurons but does not cause a Ca2+ response in layer 5 dendrites. However, (right) TMS paired with HS causes a large decrease in the HS Ca2+ response. TMS, transcranial magnetic stimulation. The results from this study demonstrate the subcellular effect of TMS on dendritic Ca2+ activity for the first time. TMS alone did not directly activate L5 pyramidal dendrites but instead activated axonal processes coursing through the upper layers and synapsing onto GABAB-mediating interneurons in L1. A similar form of synaptic activation of interneurons leading to inhibition in L5 pyramidal neuron dendrites has been shown previously with activation of callosal input to the cortex (Palmer et al., 2012). This form of 'silent' inhibition involves the activation of inhibitory conductances which are not detectable at the soma except through their eventual influence on the generation of action potential output. These results therefore highlight an effect of single-pulse TMS on the cortical network, which involves the activation of a specific cortical microcircuit. The action of TMS at the cellular and network levels is extremely complex and likely constitutes the activation of a range of different cell types leading to multiple effects (Rossi et al., 2009; Siebner et al., 2009). A recent combined experimental and theoretical investigation of the biophysical underpinnings of TMS suggested that the generation of a magnetic field is most likely to evoke firing in cell bodies as opposed to dendrites or axons (Pashut et al., 2014). This is consistent with our finding that no dendritic activity was observed with TMS stimulation alone indicating there was no direct activation of the pyramidal cell dendrites and contrasted with the signals found in both L1 and L2/3 neurons following a TMS pulse. It is also consistent with the activation of neurogliaform interneurons in L1 that target the dendrites of L5 pyramidal neurons and suppress Ca2+ activity (Ziemann, 2010; Terao and Ugawa, 2002; Pashut et al., 2011; Tamás et al., 2003; Oláh et al., 2007; Oláh et al., 2009). This form of dendritic inhibition arises from the metabotropic inactivation of L-type (Cav1) channels in the apical dendrite that underlie the dendritic Ca2+ activity (Wozny and Williams, 2011) and can last several hundred milliseconds (Pérez-Garci et al., 2006). The suppression of Ca2+ channels can significantly reduce the action potential firing of the pyramidal neuron even when the driving input to the pyramidal neuron is not predominantly dendritic (Palmer et al., 2012). The long time-scale of this form of inhibition (~500 ms) raises interesting consequences for the participation of pyramidal neurons in the cortical network. The similarity of some of the effects of TMS to interhemispheric inhibition has been noted previously in human studies (Jiang et al., 2013; Lee, 2014; Pérez-Garci et al., 2013; Ferbert et al., 1992) including its mediation via GABAB receptor-activation (Ferbert et al., 1992; Kobayashi et al., 2003), although these investigations could not examine the cellular mechanisms. For this study, we used a large coil typically used in humans and a smaller (25 mm) coil designed for use in rodents. The effect on dendritic Ca2+ was the same in both cases. Clearly, the use of TMS coils with rats where the magnetic field generated is comparable to the size of the rat brain itself raises the possibility that the effects in humans may differ. However, the cortical feedback fibers which synapse onto the tuft dendrites of pyramidal neurons are located in the part of the cortex closest to the magnetic coil (i.e. L1) in both rats and humans (Larkum et al., 1999; Larkum, 2013), suggesting there would be overlap with respect to the influence of TMS. The aim of this study was to examine the effect of TMS on dendritic activity in L5 neocortical neurons rather than a general study on the overall effects of TMS at the cellular level. We were interested in this, in particular, because we have previously hypothesized that cell assemblies over different cortical regions might be associated through the activation of dendritic Ca2+ spikes in these neurons (Larkum, 2013). According to this hypothesis, dendritic activity in these neurons is a marker of important cognitive processes. The finding that TMS targets this mechanism is therefore highly relevant to the rationale of the study and may be instructive in understanding current applications of TMS. For instance, TMS has been used to alleviate some of the symptoms of hemispatial neglect (Nyffeler et al., 2009) and auditory hallucinations (Giesel et al., 2012) via unknown inhibitory processes. In conclusion, the results presented here indicate that the inhibitory actions of TMS is due to the recruitment of upper cortical layer interneurons mediating both GABAA and GABAB-receptor-activated inhibition in the dendrites of pyramidal neurons. This may have implications for the interpretation of results in humans using TMS as a form of 'virtual lesion' (Lee et al., 2007). Male or female Wistar rats (P30-P40) were used in these experiments. Urethane (intraperitoneal, 1.5 g/kg) was used for experiments under anesthesia, according to the guidelines of the Federal Veterinary Office of Switzerland and LAGeSo Berlin. The head was fixed in a stereotaxic instrument (Model SR-5R, Narishige, Tokyo, Japan) and body temperature maintained at 36 to 37°C. A craniotomy above the primary somatosensory cortex (3 × 4.4 mm square), centered at 1.5 mm posterior to bregma and 2.2 mm from midline in the right hemisphere, was performed. The craniotomy was bathed in normal rat ringer (in mM; 135 NaCl, 5.4 KCl, 1 MgCl2 1.8 CaCl2, 5 HEPES) and the dura mater surgically removed immediately before Ca2+ recording (see below). In these vivo experiments, intrinsic optical imaging was used to identify the sensorimotor cortex before surgery. The cortical surface was visualized with green (~530 nm) light to enhance contrast and switched to red (~600 nm) light for functional imaging captured with a charge-coupled device (CCD) camera (Teli) coupled to a 50 mm and 25 mm lens (Navitar). The signal was measured in alternating sweeps before and during contralateral hindpaw stimulation (300 ms; 30 isi) governed by custom routines running in IgorPro (Wavemetrics, Portland, OR.) and Master 8 (A.M.P.I). The intrinsic signal was measured as the difference in the reflected light before and during hindpaw stimulus and was mapped onto the blood vessel pattern to be targeted during experiments. Ca2+ imaging was performed as described previously by Murayama et al. (Murayama et al., 2007). OGB-1 AM (50 µg; Molecular Probes, Eugene, OR) was mixed with 5 µL of pluronic acid (Pluronic F-127, 20% solution in DMSO, Molecular Probes) for 15 min. The solution was then diluted in 28 µL of HEPES-buffered solution (125 mM NaCl, 2.5 mM KCl, 10 mM HEPES) and mixed for a further 15 min. The OGB-1 AM solution (1.3 mM) was loaded into a glass pipette (tip diameter: 5–15 µm) and pressure-injected into layer 5 (pressure: 10–22 kPa) for 1 min. The pipette was withdrawn and the area of the craniotomy was then resubmerged with rat ringer for 2 hrs. For epifluorescence Ca2+ recordings, light from a blue light-emitting-diode (LED, IBF+LS30W-3W-Slim-RX, Imac Co., Ltd., Shiga, Japan) was passed through an excitation filter, dichroic mirror, and emission filter (as a filter set 31001, Chroma Technology, Rockingham, VT) and focused onto a fiber bundle by a 10× objective (Model E58-372, 0.45 NA, Edmund Optics GmbH, Germany). The fiber bundle (IGN-06/17, Sumitomo Electric Industries, Tokyo, Japan) was used as a combined illuminating/recording fiber and consisted of 17,000 fiber elements. The end face of the bundle was fitted with a prism-lens assembly, which consisted of a right-angle prism (dimension of 0.5 × 0.5 × 0.5 mm, GrinTech, Jena, Germany) attached to a GRIN lens (a diameter of 0.5 mm and a NA of 0.5, GrinTech). In previous studies, the fiber optic ‘periscope’ was vertically inserted 500 μm into the brain at a 90° angle (Murayama et al., 2009). This ensured that the Ca2+ responses were recorded from the upper cortical layers. However, in this study, the fiber optic could not be inserted vertically due to the positioning of the TMS coil. Instead, the fiber optic was positioned horizontally on the brain surface (‘flat’ periscope). In this configuration, the ‘flat’ periscope was able to capture the same Ca2+ responses as the ‘vertical’ periscope. As previously reported by (Murayama et al., 2009), TTX application into L5 caused a dramatic increase in L5 dendritic Ca2+ responses to hindpaw stimulation using both the ‘flat’ periscope and the ‘vertical’ periscope (Figure 1—figure supplement 1). With a focal length nominally 100 μm and 0.73 × magnification (Murayama et al., 2007), the flat periscope configuration resulted in a field of view of 685 μm diameter restricted to the upper layers of the cortex. A cooled CCD camera operating at either 100 Hz (MicroMax, Roper Scientific, Trenton, NJ) or 2.7 kHz (Redshirt imaging, Decatur, GA) was used for collecting fluorescence. The fluorescence signals were quantified by measuring the mean pixel value of a manually selected ROI for each frame of the image stack using Igor software. Data was acquired on a PC using WinView software (Roper Scientific). Regions of interest (ROIs) were chosen offline for measuring fluorescence changes (see 'Data analysis'). TMS was applied to the rat somatosensory cortex using a MagStim 200 Monopulse and Rapid 2 system (The MagStim Company Ltd., Whitland, UK) figure-eight coil, which was positioned 2–3 cm from the brain using a fixed manipulator. Experiments were typically performed with a 70-mm coil (exception: during CNQX application, TMS was delivered via a 25-mm coil, see Figure 1—figure supplement 2). Figure-of-eight-shaped coil was used as they produce a more focal current which is maximal at the intersection of the two round components (DeFelipe, 2011). The coil was centered on the craniotomy directly above the periscope fiber optic cable and angled approximately parallel to the skull curvature. TTL digital pulses triggered a single pulse TMS at 80–100% stimulation intensity (unless otherwise stated) with an inter-trial interval of at least 9 s to limit fluorescence bleaching. Given this experimental design, the electric field should be approximately ~150–200 V/m (Cohen et al., 1990) magnetic stimulation is comparatively indifferent to the conductive properties of the skull (Wagner et al., 2006), and since the small (3 × 4.4 mm) craniotomy is therefore unlikely to change the currents produced by the coil. Further, there was no behavioral response of the rat during TMS and increasing TMS strength did not elicit an excitatory response in layer 5 (Figure 1—figure supplement 3). When paired with hindpaw stimulus, the TMS was activated 50 ms before the contralateral hindpaw stimulus (> 10 trials per animal). Electrical stimulation of the contralateral hindpaw was achieved by applying a brief (1 ms; 100 V) current onto conductive adhesive strips (approximately 1 cm wide by 2 cm long) placed on the contralateral hindpaw pad. Where stated, hindpaw stimulation was also achieved by a triggered airpuff delivered to within 1 cm of the hindpaw (~40 psi; ~400 ms). All trials were interleaved in each experiment to limit time-dependent effects. The GABAB receptor antagonist CGP52432 (1 μM; Tocris) and the GABAA receptor antagonist Gabazine (3 μM; Tocris) were applied to the cranial surface, AMPA/kainate receptor antagonist CNQX (50 μM) was either applied to the cranial surface or pressure injected into layer 2/3. TTX (1 μM) was pressure injected into layer 5. See Figure 2—figure supplement 1 for cortical spread of drug application. The penetration of pressure injected or cortically applied drugs was measured using in vivo two-photon microscopy (see Figure 2—figure supplement 1). Brain tissue was imaged to a depth of 500 μm using a two-photon microscope (Thorlabs A-scope) with a titanium sapphire laser (860 nm; 140 fs pulse width; SpectraPhysics MaiTai Deepsee) passed through a 40x water immersion objective (Olympus; 0.8 NA). Images were obtained in full-frame mode (512 x 512 pixels). The fluorescence signals in vivo were quantified by measuring the mean pixel value of a manually selected (offline) ROI for each frame of the image stack using IgorPro software (Wavemetrics). ROIs included the entire field of view and Ca2+ changes were expressed as ΔF⁄F = Ft ⁄ F0, where Ft was the average fluorescence intensity within the ROI at time t during the imaging experiment and F0 was the mean value of fluorescence intensity before stimulation. Ca2+ responses were measured as the maximum value (amplitude) and total area under the positive trace (integral) within 1 s of the hindpaw stimulation. All numbers are indicated as mean ± s.e.m. Significance was determined using parametric tests (paired/unpaired student t-test) or non-parametric tests (Unpaired, Mann-Whitney test; paired, Wilcoxon matched-pairs signed rank test) as appropriate. p<0.05 (*), p<0.01 (**) and p<0.001 (***). Journal of Cognitive Neuroscience 22:1262–1269. Electroencephalography and Clinical Neurophysiology 75:350–357. Frontiers in Neuroanatomy, 5, 10.3389/fnana.2011.00029. The Journal of Physiology 453:525–546. Nature Clinical Practice Neurology 3:383–393. European Journal of Radiology 81:1273–1275. The Journal of Physiology 580:1021–1032. Current Opinion in Neurobiology 26:27–33. Frontiers in Neural Circuits, 1, 10.3389/neuro.04.004.2007. Frontiers in Neural Circuits, 6, 10.3389/fncir.2012.00026. Frontiers in Cellular Neuroscience, 8, 10.3389/fncel.2014.00145. The Journal of Physiology 591:1599–1612. Proceedings of the National Academy of Sciences of the United States of America 98:12340–12341. Journal of Clinical Neurophysiology 19:322–343. Thank you for submitting your work entitled "Transcranial Magnetic Stimulation (TMS) inhibits cortical dendrites" for consideration by eLife. Your article has been favourably assessed by Timothy Behrens (Senior Editor) and two reviewers, one of whom, Marlene Bartos, is a member of our Board of Reviewing Editors, and another is Alon Korngreen. Both reviewers evaluated your study on the cellular mechanisms underlying the TMS-mediated effects on the activity of layer 5 Pyramidal cells of the somatosensory cortex as highly relevant for the neuroscience community. TMS stimulation is used as non-invasive technology in humans for the treatment of various diseases including epilepsy and schizophrenia. It is therefore pivotal to understand how TMS influences cortical neuronal network activity. Despite the high relevance of the study some major criticisms have been formulated with the aim to improve the value of the work. Major criticism: First, the usage of TMS requires a precise calibration of the stimulus intensity above the motor cortex. Intensity is increased until the contralateral limb is moved. It is therefore important to add controls or calibrations to the study ('Materials and methods' section). Refinement of TMS strength will have a high impact on the activated neuron types. Interneurons have a lower a spike threshold during TMS stimulation than principal cells. Thus, setting the stimulus intensity will have a large impact on the results. Second, the size of the coils used in the study is usually applied for human studies. This can be considered as focal stimulation for human cortex. However, it may be far from focal for a rat cortex. Thus, the authors should address the issues of locality by changing the location of magnetic stimulation while recording from the same cortical location. Finally, the conclusions from the experimental results point to the direct activation of GABAergic cells by TMS. The manuscript would be markedly improved if the direct activation of GABAergic interneurons could be shown. Finally, the study was focused on GABAB receptor-mediated actions. However, a contribution of GABAA receptors should also be expected and thus discussed in the manuscript. A discussion on possible pre- versus postsynaptic effects of GABAB in relation to the obtained results should be discussed. Murphy et al. examine in their study the cellular mechanisms underlying the TMS stimulation-mediated effects in layer 5 Pyramidal cells of the somatosensory cortex. By using fiber optics and Ca2+ imaging in vivo, the authors showed that TMS stimulation reduced Ca2+ activity in distal dendrites of Pyramidal cells evoked by tactile stimuli. This suppression could be abolished by GABAB receptor blockers, or by abolishing dendritic synaptic excitatory transmission. TNS is an important non-invasive tool in humans and used for the treatment of various diseases including epilepsy and schizophrenia. Therefore it is important to understand what precisely TMS is doing to the activity of feedback projections. 1) It remained unclear why the planned examination of Ca2+ transients in Pyramidal cell dendrites during application of the GABAA receptor antagonist Gabazine in combination with TMS stimulation was impossible. If the authors believe that blocking GABARs induced such a strong activation of Ca2+ channels that TMT could not result in detectable changes in the Ca2+ transients than lower concentrations of Gabazine could have been tested. Please include an explanation on why this experiment was not possible. 2) Although the evidences/conclusion from the experiments are plausible and point to the direct activation of GABAergic cells by TMS, it would be great if the authors could directly show that this is indeed is the case by using for example a transgenic mouse line in which GABAergic cells are tagged with tdT (GAD65/67-Cre & viral injection of a construct which allows tdT expression under Cre control) to visually identify interneurons in the upper layers and to obtain 2P imaging from the interneuron activity during tactile stimulation with and without TMS application. Please consider whether this proposed experiment or another one directly testing interneuron recruitment wit TMS would be possible in a short time window. 3) The Discussion should include a chapter on the possible cellular mechanisms by which TMS selectively recruits GABAergic cells. 4) Is the effect of the GABAB receptor blocker pre- or postsynaptic? Please discuss possible contributions of both cellular mechanisms on the observed effects. Murphy et al. combine for the first time transcranial magnetic stimulation (TMS) and in-vivo calcium imaging to record neuronal activity from superficial cortical layers during magnetic stimulation. The authors clearly show that TMS triggers neuronal activity in cortical neurons. They present evidence arguing that the activity recorded from dendrites in L1 is due to poly synaptic activation of superficial inhibitory interneurons. This is an important step towards a mechanistic understanding of magnetic stimulation of the nervous system. Unfortunately, due to the way the authors use, or rather abuse, TMS the manuscript is out of context with the general body of scientific knowledge. This manuscript can potentially be of importance to the TMS community. I think the authors may have a true impact on the field if they perform some additional experiments and change the focus of the manuscript. The paramount problem, as I see it, is the experimental design. The authors use the TMS device without regard to its proper use. In a standard TMS experiment stimulation intensity is first calibrated over the motor cortex. The intensity is increased until the contralateral limb moves. This is called the motor threshold and all results in the TMS field are normalized to this value which changes from subject to subject. The motor threshold is not an abstract point. It has been shown that responses below motor threshold are often inhibitory whereas exceeding motor threshold is considered excitatory. Several in-vitro studies (Rotem and Moses Biophys J 2008, Bonmassar, Nat.Commun. 2012, Pashut, Front. Cell. Neuro. 2014) have shown that low intensity stimulation stimulates first neurons with low action potential threshold. In the cortex, these are probably low threshold interneurons. In contrast to the available knowledge and established procedures the authors used the Magstim at 100%. No explanation is given for these settings. This setting is meaningless when it is not calibrated to motor threshold. Since the authors did not detect any behavioural changes that were induced by TMS I suspect that they were below motor threshold. This directly leads to their observation of the inhibitory effect of TMS. To allow comparing their study to the general TMS literature it is imperative that they calibrate their TMS device by observing limb movement or by recording MEP from the limb's muscle. Many human TMS studies predict that as the intensity increases there will be larger activation of neurons in deeper layers of the cortex. At motor threshold it is possible to predict that L5 pyramidal neurons will fire. The authors are uniquely poised to demonstrate these effects with only a few more experiments and proper calibration of the stimulus. Another problematic point is the use of the 70 mm and 25 mm butterfly coils. These coils were designed for humans. The largest magnetic field (at the intersection of the two coils) occupies, roughly, a volume of 10 mm cubed. This can be considered as focal stimulation for human cortex. However, it is far from focal for a rat cortex. Thus, the authors should address the issues of locality by changing the location of magnetic stimulation while recording from the same cortical location. I predict that they will observe effects quite similar to those they already report because their stimulus is so distributed. The logic presented by the authors is somewhat circumvent. TMS is just another way to electrically stimulate neurons in the brain. Thus, it triggers action potentials leading to release of neurotransmitter. Why focus on GABAB? It is clear that GABA is released activating both GABAA and GABAB receptors. The authors point this later in the manuscript. However, placing the metabotropic aspect of the stimulus in the front weakens their argument. This will further be weakened if indeed, at higher TMS intensities, they will observe excitation. As it is written the reader may think that your primary interest in cortical inhibition and not explaining how TMS excites cortical tissue (which is what you end up showing). Major criticism: First, the usage of TMS requires a precise calibration of the stimulus intensity above the motor cortex. Intensity is increased until the contralateral limb is moved. It is therefore important to add controls or calibrations to the study (Materials and methods section). Refinement of TMS strength will have a high impact on the activated neuron types. Interneurons have a lower a spike threshold during TMS stimulation than principal cells. Thus, setting the stimulus intensity will have a large impact on the results. We have added controls to the manuscript including a new figure supplement which illustrates the Ca2+ response to increasing TMS strength in layer 5 pyramidal neurons (Figure 1—figure supplement 3). Second, the size of the coils used in the study is usually applied for human studies. This can be considered as focal stimulation for human cortex. However, it may be far from focal for a rat cortex. Although the larger 70 mm coil is indeed typically applied for human studies, the smaller 25 mm coil we use is designed for use with rodents and is even described by the manufacturer, Magstim, as the “rat coil” (despite the claim of the 2nd reviewer). The influence of the different coils were investigated and were not significantly different (Figure 1—figure supplement 2). The spatial extent of the stimulation is discussed in the text and is not referred to as focal. Thus, the authors should address the issues of locality by changing the location of magnetic stimulation while recording from the same cortical location. We now include a figure (Figure 1—figure supplement 3), which illustrates the influence of the TMS coil location on the sensory-evoked dendritic response. TMS-evoked inhibition of dendritic sensory responses was only measurable when the TMS coil was located near (within 10mm) to the somatosensory cortex. Finally, the conclusions from the experimental results point to the direct activation of GABAergic cells by TMS. The manuscript would be markedly improved if the direct activation of GABAergic interneurons could be shown. The experimental results illustrate that GABAergic cells are active during TMS. This is illustrated firstly in Figure 3 which clearly shows a large Ca2+ response in layer 1 (which consists of only interneurons) during TMS. We further show that this is not due to direct activation of these interneurons by TMS, but is because TMS activates axons which synapse onto these interneurons (Figure 4). Finally, the study was focused on GABAB receptor-mediated actions. However, a contribution of GABAA receptors should also be expected and thus discussed in the manuscript. We now include a new figure (Figure 2—figure supplement 2C,D), which illustrates that the application of the GABAA receptor blocker, Gabazine, during TMS does not cause additional dendritic activation over and above GABAB block with CGP52432. As evident from the large increase in the sensory evoked dendritic response in the presence of a GABAA blocker (see Figure 2—figure supplement 2A,B), GABAA inhibition is tonically active. This is now further discussed in the manuscript. A discussion on possible pre- versus postsynaptic effects of GABAB in relation to the obtained results should be discussed. The possible pre- and postsynaptic effects of TMS-evoked GABAB mediated dendritic inhibition is now discussed in the manuscript. 1) It remained unclear why the planned examination of Ca2+ transients in Pyramidal cell dendrites during application of the GABAAreceptor antagonist Gabazine in combination with TMS stimulation was impossible. If the authors believe that blocking GABARs induced such a strong activation of Ca2+ channels that TMT could not result in detectable changes in the Ca2+ transients than lower concentrations of Gabazine could have been tested. Please include an explanation on why this experiment was not possible. We actually did do this experiment but decided the data was relatively uninformative so didn’t include it. In hindsight, we agree with the reviewer that the reader should be able to see the results. GABAA block significantly increased the dendritic Ca2+ response to the control hindpaw stimulation, as we showed in a previous publication (Murayama et al., 2009). Since this pharmacological manipulation severely alters dendritic Ca2+ dynamics regardless of TMS stimulation, its use for investigating the effect of TMS on GABAA activation is problematic. That said, we now include an additional supplementary figure where we have applied Gabazine to the cortical surface and we find there is no additional effect above the GABAB block (see Figure 2—figure supplement 2). Furthermore, block of GABAB receptors, while not significantly affecting the Ca2+ response to hindpaw stimulation completely occluded the effect of TMS which we take to indicate that the TMS effect on dendritic Ca2+ is either predominantly or entirely through GABAB receptors. 2) Although the evidences / conclusion from the experiments are plausible and point to the direct activation of GABAergic cells by TMS, it would be great if the authors could directly show that this is indeed is the case by using for example a transgenic mouse line in which GABAergic cells are tagged with tdT (GAD65/67-Cre & viral injection of a construct which allows tdT expression under Cre control) to visually identify interneurons in the upper layers and to obtain 2P imaging from the interneuron activity during tactile stimulation with and without TMS application. Please consider whether this proposed experiment or another one directly testing interneuron recruitment wit TMS would be possible in a short time window. Firstly, the experiments illustrate that GABAergic cells are not directly activated by TMS in the region we are recording, and their activity during TMS is due to synaptic input from directly activated axons (see Figure 4 which shows a significant decrease in the TMS-evoked calcium response in layer 1 neurons – which are all GABAergic interneurons – in the presence of CNQX). Secondly, the proposed experiments would be wonderful if they were possible – however, technically, it is not possible to put a TMS coil over the craniotomy during 2P imaging as the 2P objective (and associated laser path) would be in the way. We now make it clearer in the Discussion that GABAergic cells are recruited via the direct activation of axons coursing through the upper layers of the cortex. Our previous findings have illustrated that the GABAB -mediated dendritic inhibition evoked by upper layer fibers is due to the activation of postsynaptic GABAB receptors (Perez-Garci et al., 2006; Palmer et al., 2012). We have no reason to expect different mechanisms are at play in this study, since a similar micro-network is activated. That said, we now include the possible contributions of pre- and postsynaptic GABAB receptors during TMS in the manuscript. […] The paramount problem, as I see it, is the experimental design. The authors use the TMS device without regard to its proper use. In a standard TMS experiment stimulation intensity is first calibrated over the motor cortex. The intensity is increased until the contralateral limb moves. This is called the motor threshold and all results in the TMS field are normalized to this value which changes from subject to subject. The motor threshold is not an abstract point. It has been shown that responses below motor threshold are often inhibitory whereas exceeding motor threshold is considered excitatory. Several in-vitro studies (Rotem and Moses Biophys J 2008, Bonmassar, Nat.Commun. 2012, Pashut, Front. Cell. Neuro. 2014) have shown that low intensity stimulation stimulates first neurons with low action potential threshold. In the cortex, these are probably low threshold interneurons. In contrast to the available knowledge and established procedures the authors used the Magstim at 100%. No explanation is given for these settings. This setting is meaningless when it is not calibrated to motor threshold. Since the authors did not detect any behavioural changes that were induced by TMS I suspect that they were below motor threshold. This directly leads to their observation of the inhibitory effect of TMS. We now include a new figure (Figure 1—figure supplement 3), which illustrates the Ca2+ response in Layer 5 pyramidal neuron dendrites to different intensities of TMS. An excitatory response was not observed in layer 5 pyramidal neuron dendrites at any intensity. Our results show inhibition of sensory-evoked responses by TMS in layer 5 pyramidal neuron dendrites, however, as illustrated in Figure 3, layer 2/3 neurons have an excitatory response. Due to the necessary imprecision of the stimulation (given the comparative sizes of the coil and the rat brain), the motor cortex would be expected to be affected similarly to the somatosensory cortex in our experiments particularly since these cortical areas overlap in rats. The reviewer is correct that TMS pulses were below motor threshold as we never detected movement. Nevertheless, we also saw no evidence for direct activation of low threshold inhibitory neurons as evidenced by the complete occlusion using CNQX. To allow comparing their study to the general TMS literature it is imperative that they calibrate their TMS device by observing limb movement or by recording MEP from the limb's muscle. Many human TMS studies predict that as the intensity increases there will be larger activation of neurons in deeper layers of the cortex. At motor threshold it is possible to predict that L5 pyramidal neurons will fire. The authors are uniquely poised to demonstrate these effects with only a few more experiments and proper calibration of the stimulus. We do not induce motion or limb movement while using maximum TMS intensity and therefore we are unable to increase the TMS strength to induce excitation in layer 5 pyramidal neurons. This may be because our experiments are conducted under urethane anaesthesia. This is necessary to be able to record Ca2+ transients during hindpaw stimulation and TMS in vivo, however, this may occlude any expected limb movements. The 25 mm butterfly coil was designed for use in animal models and is even described by the manufacturer (Magstim) as the “rat coil” – that said, we did not see influence of coil size on the effect of TMS on the sensory evoked Ca2+ response (see Figure 1—figure supplement 2). Further, we now include a figure illustrating the effect of moving the TMS coil to different locations (Figure 1—figure supplement 3). L1 can be the activation of specific dendrite-targeting, GABAB mediating inhibitory neurons. This cell type (the neurogliaform neuron) has been well characterized and predominantly mediates its effect through GABAB receptors probably due to volume transmission. Furthermore, activation of GABAB receptors has a remarkably specific effect blocking dendritic L-type Ca2+ channels (cf Perez-Garci et al., 2013). Here we report that TMS appears to recruit this sub-population of cells and that blocking GABA- B receptors completely occluded the effect of TMS on dendritc Ca2+ activity. Given this, it would seem unwise to assume that GABAA receptors played any significant role in suppressing dendritic Ca2+. On the other hand, the experiments do suggest that TMS could be used as a tool to investigate dendritic excitability non-invasively in other preparations (e.g. humans) that may give us a window into this otherwise tricky subject. Of course, further tests need to be made for the extension of these results to other preparations, and these were clearly out of the scope of this study, but the implications of these initial data in rodents could, in our opinion, be enormous. If the reviewer is correct, that under other conditions the situation might change (“at higher TMS intensities, they will observe excitation”), this would not change the prediction that TMS can in principle be used to down-regulate dendritic Ca2+ activity non-invasively (e.g. at lower intensities). This work was supported by SystemsX.ch (NeuroChoice). We would like to acknowledge the software assistance of Juan Nunez-Iglesias at the Victorian Life Sciences Computation Initiative. We would also like to thank Rogier Min, Julie Seibt and Adam Shai for technical assistance and discussions. Animal experimentation: All experiments were conducted in strict accordance with the guidelines of the Federal Veterinary Office of Switzerland and LAGeSo Berlin (Ethics number: GO257/11). © 2016, Murphy et al.